Eighth grader San Lee just moved to Pennsylvania and started at a new school. He's moved around a lot, from Texas to California to Alabama... and in each place he's assumed a new identity, heeding to his father's advice to "do as the Romans do". Now, with his dad (somewhat mysteriously) out of the picture, San has to decide how he's going to present himself at school. Which of his identities will he choose? Conservative religious kid? Skater boy? Macho jock? When he finds out that his social studies class is studying Eastern religions, which he studied the year before at his Texas school, San's new identity is thrust upon him: Zen master. It fits perfectly with his appearance (he and his mom don't have much money, so he's forced to wear sandals in the winter and has no coat). And the object of his crush, a Beatles-loving guitar-playing wild-haired girl named Woody, seems to dig it. So San goes to the library and studies up... But before he knows it, things have gotten way out of control. Will San be able to come clean and figure out his own identity? 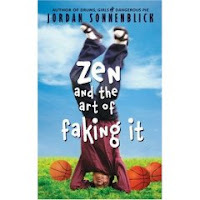 Or will he continue to the a master of Zen and the Art of Faking It? Jordan Sonnenblick is one of my newly-discovered favorite authors. While I didn't find his newest novel to be as funny or heart-breaking as his previous novels have been, I still really loved the characters and the interesting situations he placed them in. San has a real issue with identity in this book. He's always been trying to please other people (namely his father), so he has no idea who he really is. As San gets to know his crush Woody, he finds out that she has a lot of the same issues. I think this book will really speak to middle-schoolers, many of whom are going through a period of figuring out who they are and who they want to be. I found the whole idea of San being a Zen master to be a really interesting concept for a story. First of all, I don't know much about Zen or any Eastern religion and this story sparked my interest (Sonnenblick does include a recommendation for people who want to learn more about Zen). Secondly, it was awesome how as San was "faking it" and studying up on Zen Buddhism, he actually learned a lot and started to practice some of the Zen things he was learning about. For instance, he "meditates" at the beginning of each school day and it starts out as a way to show off for Woody, but as he keeps doing it, San actually gets into it. A note about the cover art... I don't really understand why San is standing on his head, but I really dig the image of his socks-and-sandals sticking out in the middle of the sky. So, yes. I enjoyed it. I have really enjoyed all of Jordan Sonnenblick's books. They're each very different, but each of them have great characters that stick with you. He's one to watch. And he is a master of titles (Notes from the Midnight Driver and Drums, Girls, and Dangerous Pie). I love his titles. I wish I could write titles like him. If I could, my last two NaNoWriMo novels would not be "Untitled".